One of the best ways to build a secure income and increase your net intake is to offer products or services with recurring billing. With recurring billing, you charge the consumer on a set schedule. For a continued service, that bill would typically come once per month, ensuring a steady income for your business. You can also use recurring billing to set up easy payment plans, letting you offer higher-priced products in affordable ways. Let Veritrans help you set up a recurring billing system. From the initial set-up all the way to collections, we can help you manage your recurring billing, giving you more time to focus on your clients. Some consumers may have security concerns, because this billing system requires that you store their credit information in order to pull it each month. By working with an established credit card processor such as Veritrans Merchant Services, you can rest assured that consumer information is being handled securely and appropriately. Ready to learn more about how recurring billing and credit card processing can help your business? We’re ready to talk to you. We’ll answer every question you have and provide you with a noobligation consultation. We can even go over your current credit card processing contract to help you make the best choices for your budget and needs. 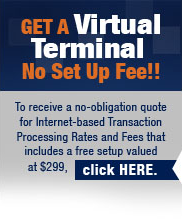 Call 1-877-496-9395 today or via email at info@Veritransllc.com for your FREE consultation.